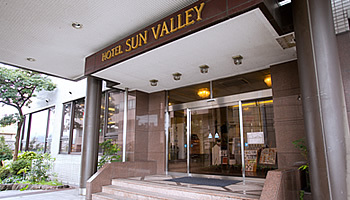 Hotel Sun Valley and Hotel Sun Valley Annex are conveniently located for anyone wishing to sightsee in Beppu, home to the largest number of hot springs in Japan, and with Japan’s highest total hot spring output. 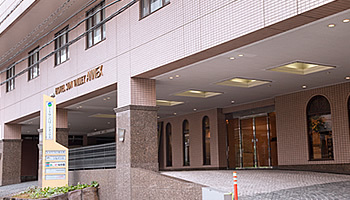 The hotels offer a rich range of facilities, including large hot spring-fed communal baths, restaurants serving regional Japanese cuisine, a Western buffet, beauty salon and hair salon, fitness gym, and day-care center. 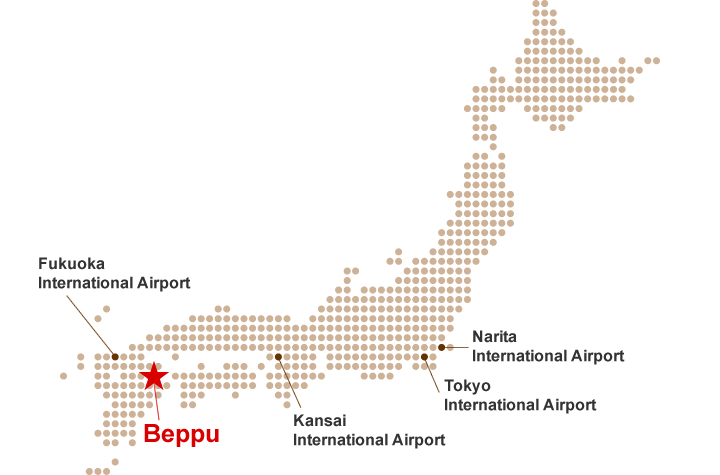 Beppu is a popular base for sightseeing throughout Oita locations such as Oita City, Kitsuki City, Usuki City, and Yufuin, as well as a sightseeing location when travelling through Kyushu to destinations such as Mount Aso, Fukuoka, or Miyazaki. With so much to offer, it is an excellent place to visit! 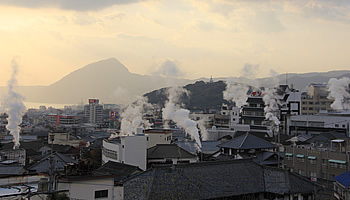 Beppu Onsen has the most hot springs, with the most output, of anywhere in Japan. It has the most bathable hot springs of anywhere on earth. It is broadly divided into eight hot spring areas, each with its own water qualities, so visitors can enjoy various types of hot springs. It also has unique hot springs such as mud springs and sand springs. 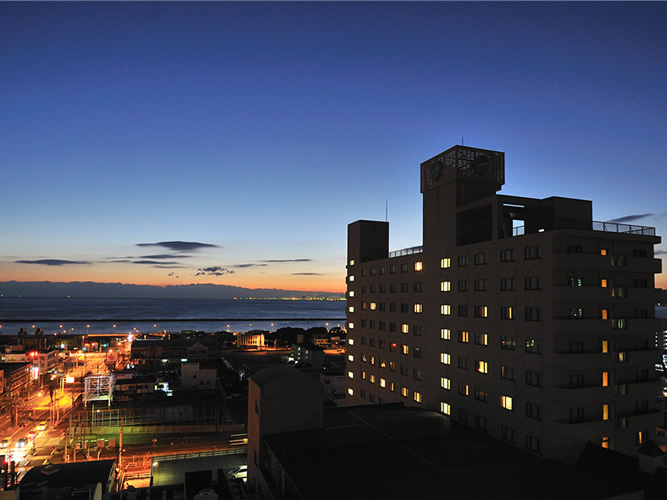 There are many ways to enjoy Beppu Onsen, from the hot springs districts in town to sightseeing spots rich in natural beauty. 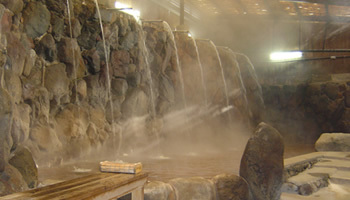 Our hotel provides access to Hyotan Hot Springs, which has been awarded three stars by the Michelin tourist guidebook. At this recreational facility you can enjoy various types of hot springs and Japan’s hot spring culture. Shuttle bus service is provided. The hot water, steam, and bubbling mud which well up from 200 to 300 m below the surface, featuring different colors and constituents, are called hells. 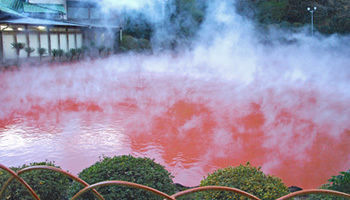 The Jigoku Meguri (Hell Tour) is a typical Beppu sightseeing tour of eight different hells, such as the cobalt blue “Umi-Jigoku”, the bright red “Chinoike-Jigoku”, and the “Tatsumaki-Jigoku”, in which hot water jets roughly 20m into the air. “Jigoku Mushi” (“Hell-steaming”) is a popular, simple cooking method which brings out the natural taste of ingredients while giving them a distinct flavor. 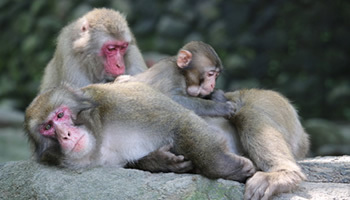 There are many sightseeing spots that can be enjoyed by couples and families alike, such as Takasaki Mountain, where visitors can glimpse wild monkeys in their natural habitat, the nearby Umitamago Aquarium, the popular Safari Park, with jungle buses from which visitors can feed the animals, amusement parks, and more. Copyright（C）2015 Hotel Sun Valley. All rights reserved.